IN A half-dozen plants converted to peacetime pursuits, riveting hammers are pounding out aircraft to bring transportation by air to thousands of American hamlets at a price almost any traveler will be able to afford. Some of these air liners, built from design lessons learned during the war, will be able to cross the United States in less than seven hours. Some, engineered specifically for local flights on interurban schedules, will be only half that fast. All of them, for the first time in the history of the U.S. air transport , are being built for specific purposes. Conveniences for the traveler that these planes will provide reflect the public’s criticisms of the air carriers for the last decade. They also provide a pretty good picture of what the public wants—and is going to get-from the air lines in the next five years. The public is fed up with traveling at 200 m.p.h. between terminals and then waiting 20 minutes or more to retrieve a traveling bag, laboriously unloaded from badly designed transports. So, presently, the air passenger will be able to carry his own bag aboard and stow it under his seat or in a rack over his head, or in a special baggage compartment at the plane’s entryway. The public is fed up with all the hocus- airport terminals and even aboard the airplanes themselves, that takes passengers’ time and delays departures. So, on shorter runs at least, a passenger presently will be able to walk up to an airport ticket desk, buy his passage, show it at the gate and go aboard without the bother of a reservation. The public is fed up with time wasted at stops. So in one type of transport the time spent on the ground will be cut by providing one door for boarding passengers and another for those getting off. The public wants air lines that go to a lot more places on the map. It wants to be able to travel by plane when the weather is stinko. It wants adequate ventilation in planes that are not too hot and too cold by spurts. It wants altitude conditioning on all transports, so a man’s ears won’t hurt as his plane descends to land. It also wants more speed for its dollar. All these it is going to get, plus a few more. 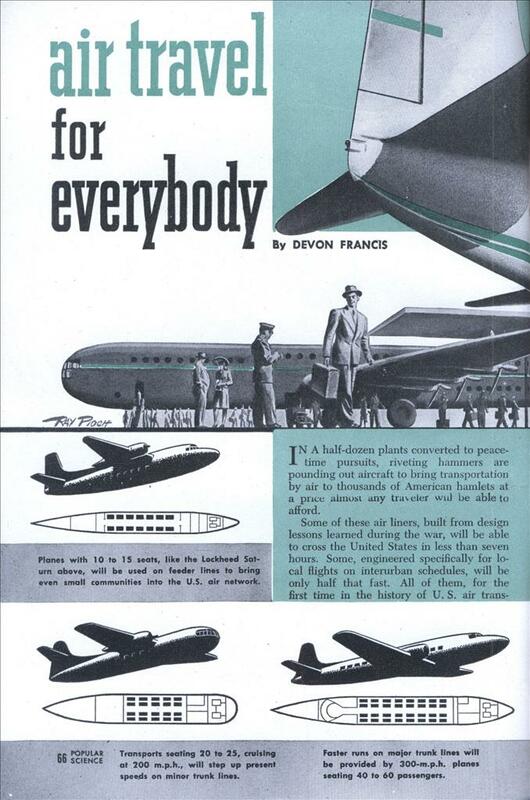 By 1951, air transports and the airline pattern itself, both domestic and intercontinental, will confound the most extravagant predictions of the men who were nursing a few scrawny air lines to maturity in 1931. But for all the planning that is under way, the growth and character of air-line service are bound to be somewhat hodgepodge for the next few years. The carriers themselves are guessing at exactly what’s coming. They are in the midst of a tepid re-enactment of the railroads’ expansion three-quarters of a century ago. It is a tepid performance because the air lines are rigidly—some critics say too rigidly—controlled by the Government. What’s best—cheap transportation in economically run “day coach” planes, or higher- cost transportation on plush seats? American Airlines, biggest U. S. carrier, favors low-cost travel for everybody. Many of its competitors are increasing, instead of cutting down, the plush. What’s best—200-m.p.h. planes at a cost to the passenger of three and a half cents a mile, or planes that will fly at 350 or 400 m.p.h. with considerably higher fares? That question is in a fair way to being answered. The slower planes will go on interurban runs, the faster ones on transocean and one-stop and nonstop transcontinental runs. In-be-tween planes will fly middle-distance runs. What’s best—planes that sacrifice cruising speed for the ability to get into tiny airports, or faster planes that need more runway? That is the hardest question to answer. Good airports are few, and cities and towns are loath to put up money for better ones even if the Government chips in. What’s best— 14-passenger planes that leave every hour, or 28-passenger planes that leave every two hours? Some aircraft manufacturers, hawking their wares among the air lines, are betting on the smaller plane. One thing is certain: Faster, more efficient planes are coming. They will go farther on a gallon of gas, and that means lower fares. One manufacturer already is talking about the possibility of New York-to-San Francisco flights in less than eight hours for as little as $86. That compares with $118.30, tax extra, at present. The Pullman fare for the same trip is $127.13 (or 4.01 cents a mile); that by rail coach, $63.12; by bus, $45.25. The Rainbow, in fact, is designed to climb to 40,000 feet, above the weather. Even combat planes seldom went that high during the war. Designed specifically for great altitude, the Rainbow costs less to operate at a height of almost eight miles. In five more years, and maybe less, the person who makes an air trip of considerable length will draw his final dividend from the war in comfortable flying. It was the war that accelerated work on the turbine as a power unit. Today the turbine, driving a conventional propeller and spewing burned gases from a jet pipe for supplemental thrust, is being installed in a version of the new Martin transport for experimental cargo work by United Air Lines. When it has proved its reliability, it will be fitted to passenger transports. Turbine power, in contrast to that obtained from reciprocating gasoline engines, is practically vibrationless. Gone will be the aggravating, often nerve-wracking shaking that has always characterized powered flight. Because turbines produce more power per pound of weight, their adoption will mean even greater speeds; 400 m.p.h. will be no novelty. It will also mean bigger planes if the volume of passenger traffic calls for them. Consolidated-Vultee won’t attempt to build a Model 37 until it can get turbines of 5,000 horsepower. The general adoption of turbines for long-range flying, incidentally, will make operation at high altitudes mandatory. Turbines work better higher up. Altitude flying will obviate the “bumps” encountered in the turbulent air of storms, high winds and heat reflected from the earth. Give the aircraft manufacturers credit. Trying to keep their heads above water amid ruthless competition, they have done most of the work in the year since the war ended to make flying more enticing to the air-line customer. The carriers themselves, spoiled by six years of more business than they could handle, too often have been characterized by the reservation clerk who is snippy over the telephone. The plane makers weren’t blessed with that problem They had to go out and get business. To sell planes they had to build better ones, with more appeal. So they are shooting the works. That figure, three and a half cents, probably is stretching it a bit. Individual aircraft manufacturers and carriers say four cents would be more like it. A Plane for Every Purpose The A. T. A. believes that the current, frenzied purchase of new transports by the air lines to cash in on a war-born bonanza of patronage ultimately will create an orderly, stepped-down pattern of air-line equipment: Planes with 80 to 200 seats for intercontinental flights. Planes with 40 to 60 seats for main trunk lines. Planes with 20 to 25 seats for smaller trunk lines, such as those of considerable length over sparsely settled areas. Planes with 10 to 15 seats for feeder lines serving communities with populations as small as 2,500. The main trunk lines also will have a certain number of 80- to 125-passenger planes for one-stop or nonstop coast-to-coast schedules. Some of these, in turn, will be fitted as sleepers. In their anxious, keep-up-with-the-Joneses buying of new transports—a windfall, by the way, to aircraft manufacturers who had billions in war orders canceled overnight—the air lines really deserve a little sympathy. They are in a dither. They are filthy rich in patronage but they want more. Slide-Rule Answers In casting around for answers, the only real truths the carriers can get their teeth into are those that can be proved on a slide rule. They know that the volumetric capacity of a conventional airplane varies as the cube of its linear dimension, while fuselage structure weight varies roughly only as the square. Put in plain language, that means the bigger the airplane, the more profit. As yet the theory of small planes for short runs is only a theory. People may begin using airplanes as they use buses. If the air lines buy big planes, which can be operated more economically per seat than small planes, they stand to lose their shirts if they don’t carry good-sized loads. If they get timid and buy small planes of only fair speed in anticipation of modest patronage, they not only risk the larger profits on more expensively operated equipment but may lose customers as well to competitors with bigger, faster planes. They can’t hook on a glider to take care of overflows as a railroad hooks on an extra car. Whatever they buy, the public will benefit. More than 300 companies have filed applications with the Civil Aeronautics Board, the agency which rules the industry with an iron hand, to establish feeder routes. Right now only 61 of the nation’s 665 communities with populations of 10,000 to 25, 000 enjoy air-line service. Almost half the nation’s counties have no airports. Of the 678 points that feeder and trunk lines propose to add as stops, only 93 have satisfactory airports. That means a lot of heat is to be put on American cities and towns to build new airports or improve old ones. The more airports, the more places the air-line customer can fly. Transports Speed Up In the next five years he will be flying faster, too. Yesterday’s standard air-line speed of 170 m.p.h (advertised tongue-in-cheek as “three miles a minute”) is being boosted right now with transports, some of them remodeled from the war, that do 200 to 275 m.p.h. Even short-haul transports like the new 14-seat Lockheed Saturn will travel 200. 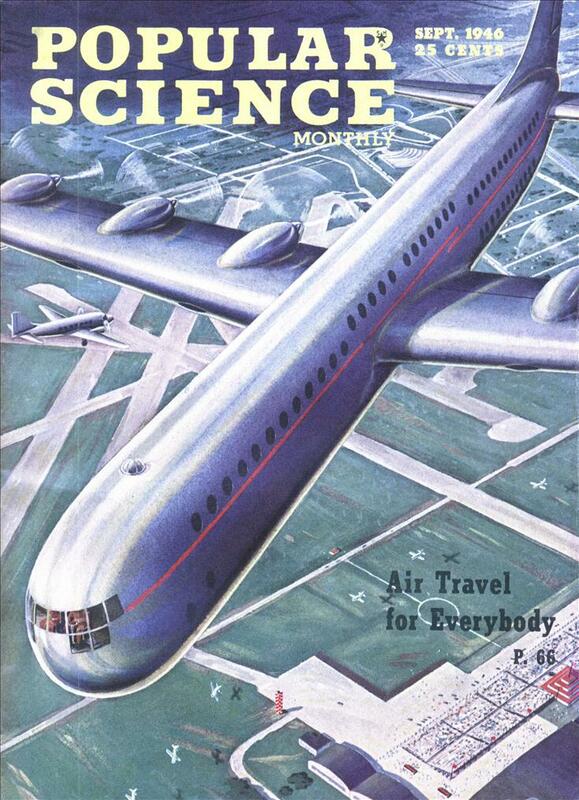 The 24-passenger Boeing 417, a pint-sized companion of the same company’s Stratocruiser, will fly at 196 m.p.h. The 40-passenger Martin 202 will make a bit less than 300; the 40-passenger Consolidated-Vultee 240 type, a full 300; the 52-passenger Douglas DC-6, a little more; the 80-passenger Stratocruiser, 340; the 200-passenger Consolidated-Vultee 37 model, 340, and the 46-passenger Republic Rainbow, 400. All of these planes are on order. No deliveries to air lines will be made on any of them before the end of this year, and most of them won’t be off the production lines until 1947 or 1948. The Convair 200-passenger job, commercial version of the Army’s C-99, won’t be flying before 1950. The air-line customer may expect to fly higher. All the new transports except those devoted exclusively to short hauls will be pressurized for altitudes of at least four miles and new techniques will maintain sea-level pressure to as high as three miles. The XC-99 did fly, but Pan Am canceled their orders for the commercial version. What really revolutionized air travel was the jet engine. Kosher Ham: Quite true, the XC-99 was all proven technology from the B-36 bomber. Bothe were done in by the jet engine as KH says. This is an amazingly accurate prediction. They lowballed the current speed of airplanes and their capacity, but it’s all there. I didn’t know overhead bins were a novelty once upon a time, interesting! Ohh they forgot the subsidiaries required to keep such an industry alive. Like tax free fuel and free airports. And I think that the small local American airlines that sprang up in the Fifties mostly used army surplus DC-3s, as there were literally thousands of them lying about after the War. They weren’t advanced aircraft, but they were cheap and incredibly robust. There is a DC3, N136PB, that has over 91,000 hours in the air. Every time it flies it set a new world record. The airports are not free. It does cost the airlines to park a plane overnight. Most general aviation airports also charge an overnight tie down fee. Still the cost of building an airport and buying airplanes is more cost effective than high speed rail. Odd really, all the generalities of the article have come true except ; service, comfort and speed through the airport it’s self. Oh and the food still tastes like it came from a vacuum. Everyone was dressed up to fly, it was a big deal.